Justin Bieber seems to be in a mood to de-stress today. The singer earlier posted a heart-warming post for his fans talking about him dealing with depression and the promise to bounce back with some new music. Although, it seems the 25-year-old singer is now fed up of internet trolls who have been targetting his marriage to Hailey Baldwin time and again now. The singer took to Instagram and posted a big message for one troll who even goes by the handle 'jaileyisajoke'. In this message, the Sorry singer also addressed rumors about his ex Selena Gomez. 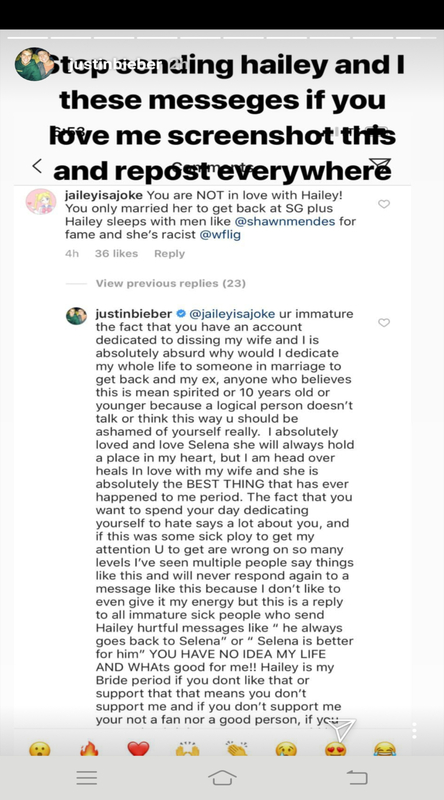 The singer wrote, "This is a reply to all immature sick people who send Hailey hurtful messages like 'he always goes back to Selena' or 'Selena is better for him' YOU HAVE NO IDEA MY LIFE AND WHATS good for me!! Hailey is my Bride Period. If you don't like that or support that, that means you don't support me and if you don't support me, you are not a fan nor a good person! "Justin Bieber Announces That He Wants To Focus On Repairing 'Some Deep Rooted Issues' And His Marriage Before Releasing A New Album. Speaking about his ex-girlfriend, Selena Gomez, Justin wrote, " I absolutely loved and love Selena, she will always hold a place in my heart, but I am head over heels in love with my wife and she is absolutely the BEST thing to have happened to me. Period." It all started after the troll wrote some mean things about Justin and Hailey's relationship that made him to finally react. The singer has been seeking help for depression and all this while, his wife Hailey has been immensely supportive of him.